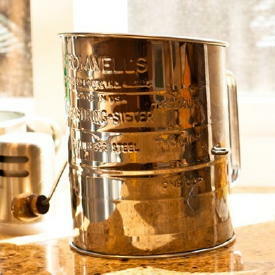 Jacob Bromwell is a company that has been around since 1819. There's some very cool stuff about this company and their products! Everything has a lifetime guarantee – WOW! Their items are handcrafted in the US – which is nice for those of us who live here and want to support the industries where we live. These products are both "old-fashioned" and "timeless" - at the same time. Sometimes, as they say, you don't need to fix it if it isn't broken! Well crafted, sturdy tools just make life in the kitchen a whole lot easier. There's nothing worse than a flour sifter that doesn't sift! These are simple, straightforward designs that work. And continue to work. And if they don't work, they have a lifetime guarantee – ye gads – that's amazing! This seems straightforward – it's a flour sifter, right? Not quite. There are choices! You can order this for right handed or left handed operation. You can get this in tin or stainless steel. It comes in 1 cup, 3 cup or 5 cup sizes. AND, if that wasn't enough – you can choose your style – Crank, Shaker, or Squeeze type. When's the last time you saw this many options for a flour sifter? Want a flour sifter that's a little less boring and a whole lot more colorful? 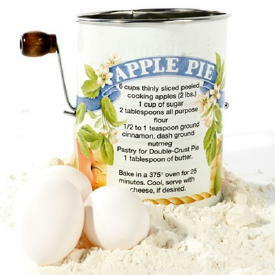 Your sifter can have a pumpkin pie recipe on the side, or ivy designs, or "I Love Grandma". There are 10 designs available. These come in a 3 cup size, made of tin. You do have an option for right handed or left handed operation. 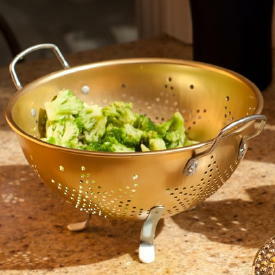 There's no way to have a well equipped kitchen without having a decent colander. Yes, there are those plastic ones… yuk. Jacob Bromwell handcrafts each colander they make – and they're a nice large 3 quart size. The drain holes are actually a series of repeating star patterns. You can choose between silver or gold anodized finishes as well. Yes, a colander can be gorgeous! 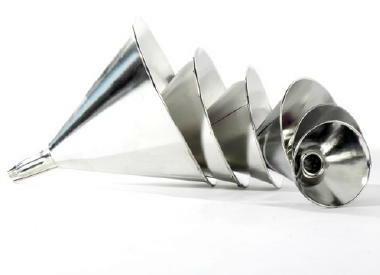 These are truly handcrafted funnels and they come in many different sizes. The smallest is a mere ¼ pint, and they go up from there to a whopping 3.6 quart size. They stack inside each other quite nicely as well – in case you need all of them! Even nicer – you can get these in their original tin or in stainless steel. You get a pack of three shredders – small holes that are 1/8", medium holes that are 1/4" and large holes with 1/2" diameters. Nice sturdy handles as well. These are available in tin or stainless steel. These have to be a "wonder" because there are testimonials that talk about people having inherited these from their family – and they are still sharp and working well after 91 years! Try to think of something else in the kitchen that will last that long! This is perfect for hard cheese and any grated vegetable dish (that goes along with the freshly grilled fish of course!). 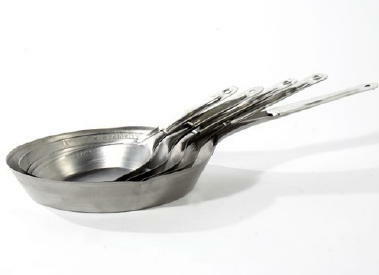 Nice easy to hold design and it's available in tin or stainless steel. And, Jacob Bromwell has now decided to offer their customers even more! 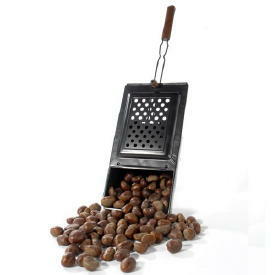 You now receive a set of two for the price of one ~ a tin one and a stainless steel grater. Wow! 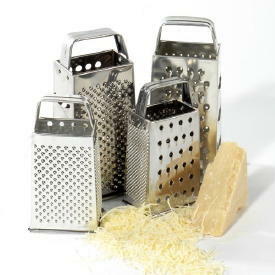 This is not your typical stand up box grater, because it has a lifetime guarantee! 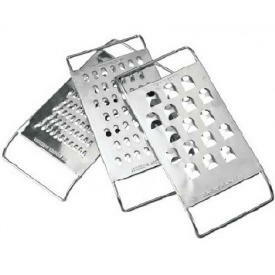 I can't tell you how many of these types of graters I've gone though in my lifetime. The "other" brands get wobbly, or the handle falls off. That worry is gone with these. 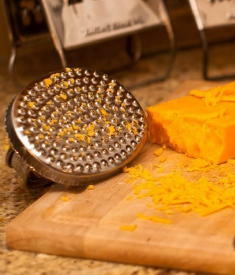 There are 3 different size grating surfaces and a slicer. They come in 7" and 9" tall sizes and are available in tin or stainless steel. For the BBQ ~ Campfire ~ & Your Kitchen! Although these are designed for heavy duty use, particular over open flames, they would still work great in your "regular" kitchen. These frying pans are handcrafted in the United States The bodies are made of heavy gauge steel and have tin handles to keep your hand cool. You can choose from 6", 7" and 8" sizes at the moment. Think of your freshly caught fish sizzling away in this beauty! All skewers are not created equal! How nice to actually not have to throw skewers away after you use them. And these have a nifty little slide on them to push the food off the prongs. Made with wooden handles and two tines, these come in a chrome plated finish. 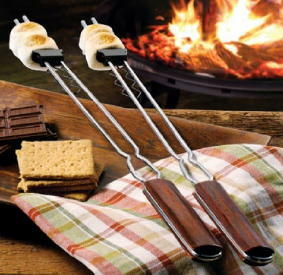 Whether you're doing the roast the marshmallows over the fire thing, or skewering delectable shrimp on the barbie – you'll be please with these hand crafted products. Roasted chestnuts don't have to come around just at Christmas time. You can make them anytime with this old fashioned roaster. The design may be 200 years old but it's really nice to have modern day matches and firestarters! This comes in a choice of finishes – the original tin or rustic non-stick black. You even get instructions and a recipe booklet. This is a very neat present for the person who simply has everything! You love popcorn! How about something a little more fun than sticking that bag into the microwave? 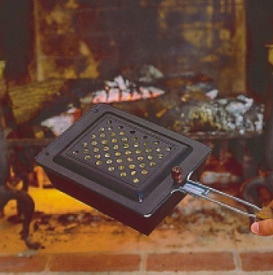 This old fashioned popcorn popper will work in your fireplace, on a BBQ, in a campfire, AND, even on your kitchen stove. Made by hand, in the United States, this popper comes with a lifetime warranty! Toast – what's up with toast? Kind of like my graters, I've gone through a ridiculous number of toasters in my life. Toast is delicious – crunchy – earthy – and a pain in the you know what to get it to come out "toasty"! No more! The old fashioned toaster has been revived for the modern day. 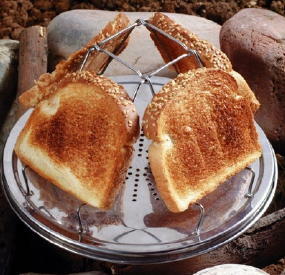 It folds flat, holds 4 pieces of bread, and works on all stoves. Of course it's pretty nice when you're camping as well!